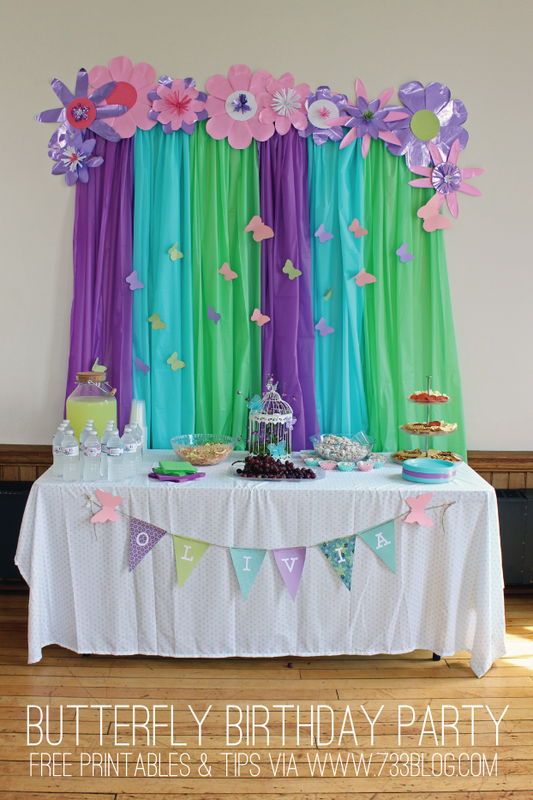 I am excited to share my daughters Butterfly Birthday Party with you all today. 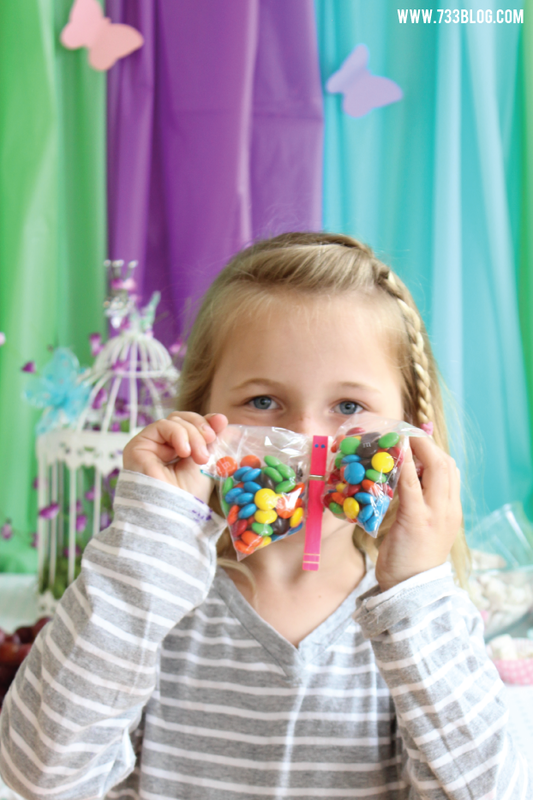 This was a super easy party to pull together and I have some fun tips to share with you that will make setting this party up a snap for you! 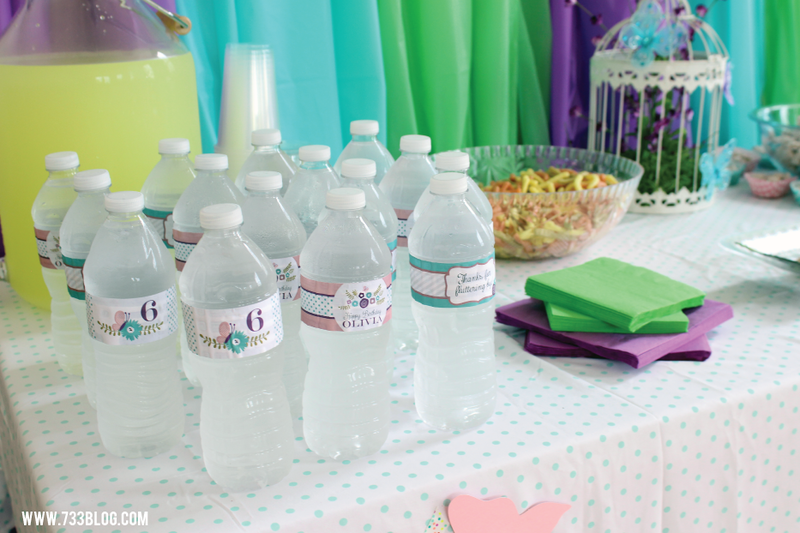 I also want to note that the majority of the items that I used came from the dollar store, so it is a party that can be pulled off on a budget! All available free printables can be found at the bottom of this post. 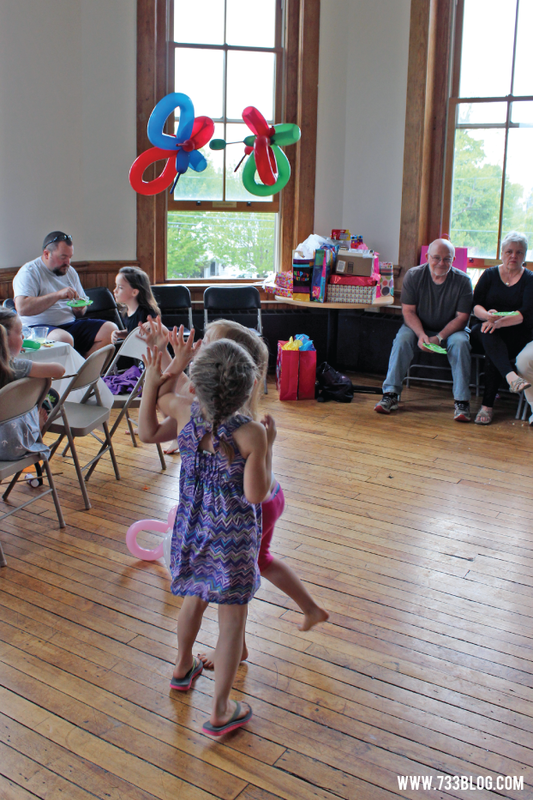 I rented a room at a local community center and it turned out to be the perfect space. It was full of big windows that let in tons of light and had a ping pong table and air hockey table right outside the room. Also outside was a tennis court, field and playground, though I decided not to venture outside this party. I always make the food table the focal point. 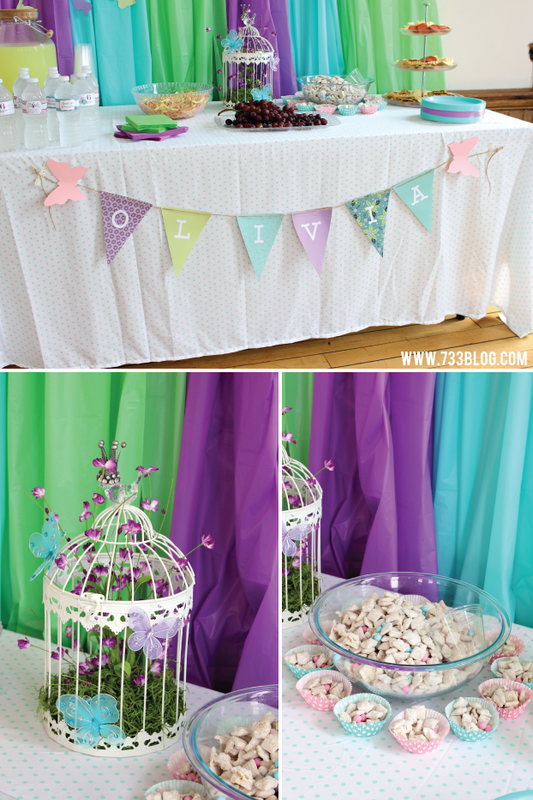 For birthday parties I spend the most time decorating that space as a statement piece and then minimally decorate the rest of the space. For this table I used a (non-ironed) sheet from my linen closet as the tablecloth. 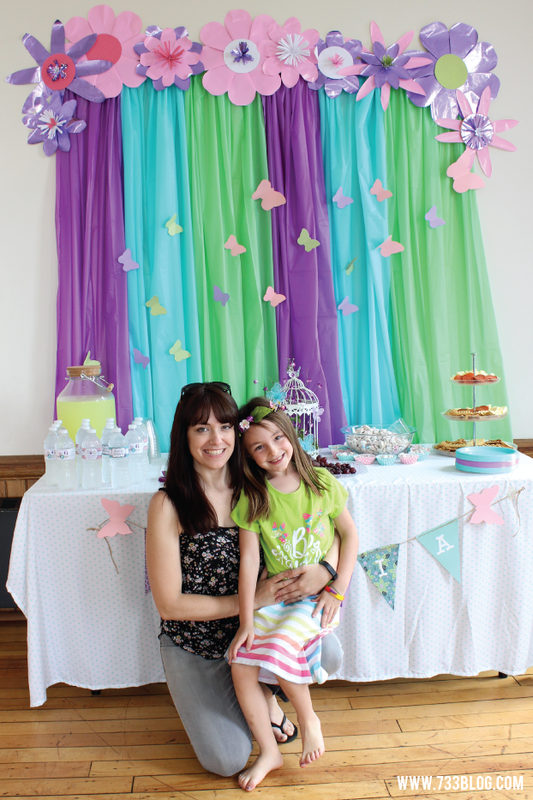 To recreate the backdrop: I used 6 plastic tablecloths that I picked up for under $1 each at Walmart. I used a needle and yarn and strung them together ahead of time. 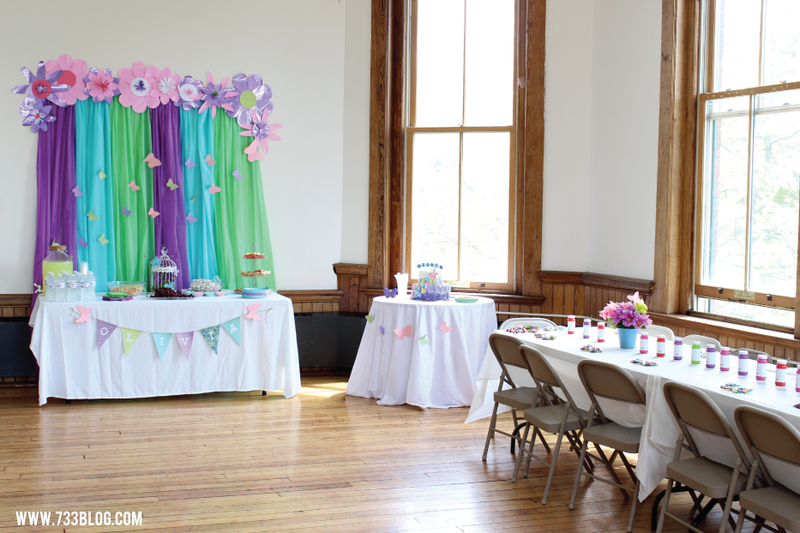 Once I got to the party space, I used the new removable 3M Command Strip Party Hooks to hang them on the wall. This worked PERFECTLY and saved SO much time during set-up. I made all of those gorgeous flowers out of wrapping paper with the We R Memory Keepers Template Studio that I won at SNAP. Of course you CAN make these without the assistance of this tool, but it made it so much easier. 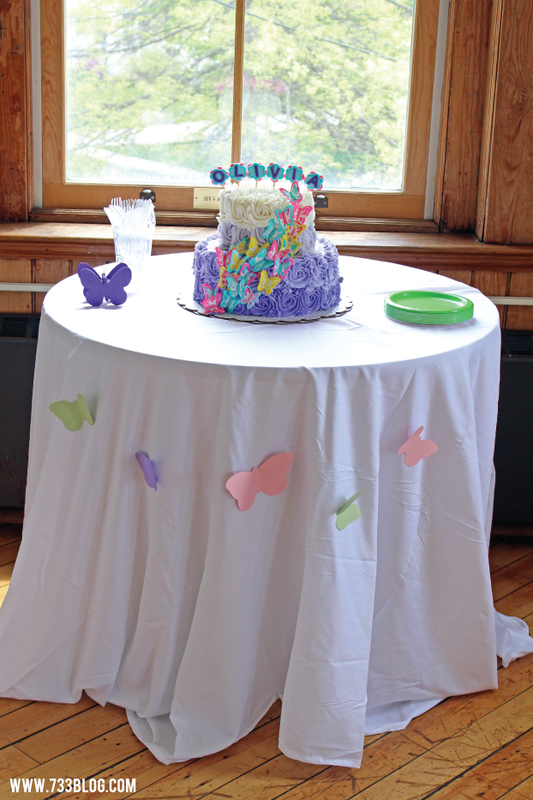 I created the cardstock butterflies with my Cricut Explore (again can do without this) and used regular Scotch tape to adhere them to the backdrop. I made the banner with the We R Memory Keepers Banner Punch Board and I cut the letters with my Cricut Explore (affiliate link for your convenience) and strung the whole thing onto twine. I borrowed a birdcage from my friend and filled it with moss and some fake flowers. I picked up some organza butterflies from the dollar store and placed them around the cage. All of the decorations for this table cost me a total of $18! The invites I designed for the party were fun, yet sophisticated. The party was after lunch so I went light on the food. I served veggie sticks, Chex Muddy Buddies, pepperoni, cheese and Butterfly shaped crackers and pretzels. I was planning on making grape caterpillars but the skewers I bought turned out to be jumbo and I didn’t realize it until it was a 1/2 hour prior to the party and I went to make them! So instead we just had a platter of grapes. I served lemonade and water for drinks. The gorgeous cake came from Cakes by Keeli. I totally recommend her if you are local (Franklin County, Vermont). 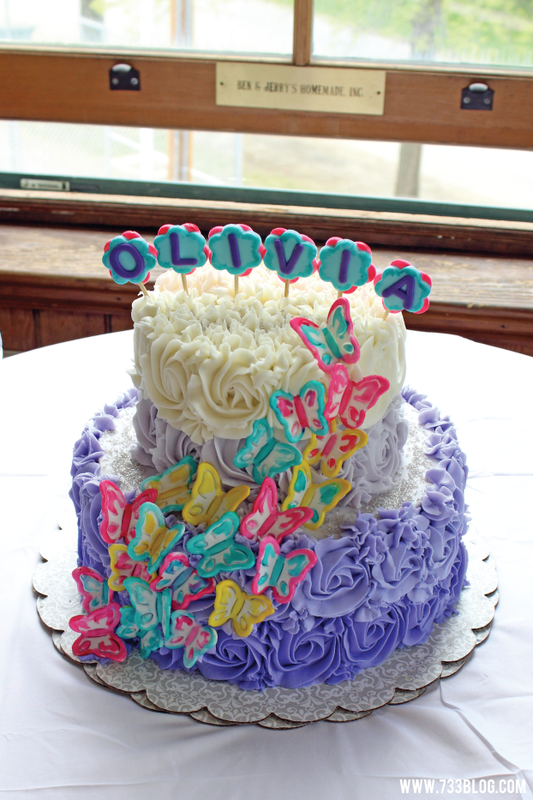 The cake was absolutely delicious and everyone that walked into the party commented on how beautiful it was! I set up a table for the children so that they had a space to place their things as well as a space to eat. I made the flower arrangements using pots and silk flowers from the dollar store. 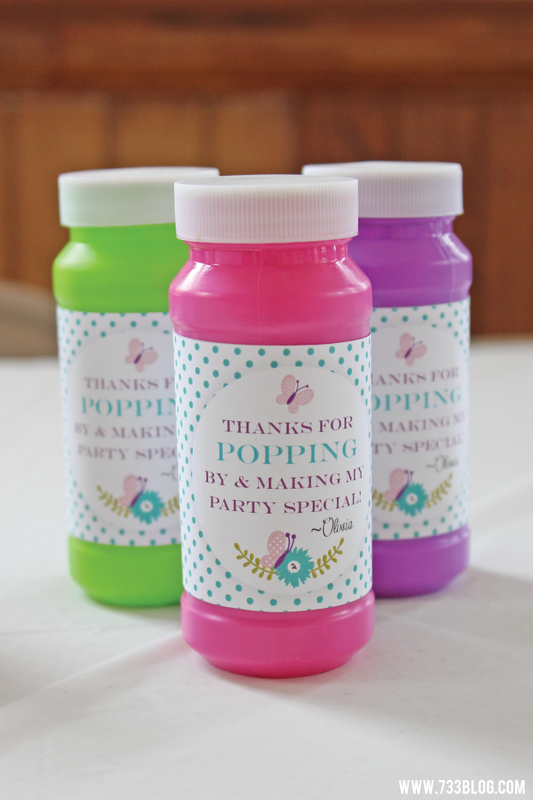 The bubbles were also from the dollar store and I wrapped them with custom wraps that I designed to match the theme. 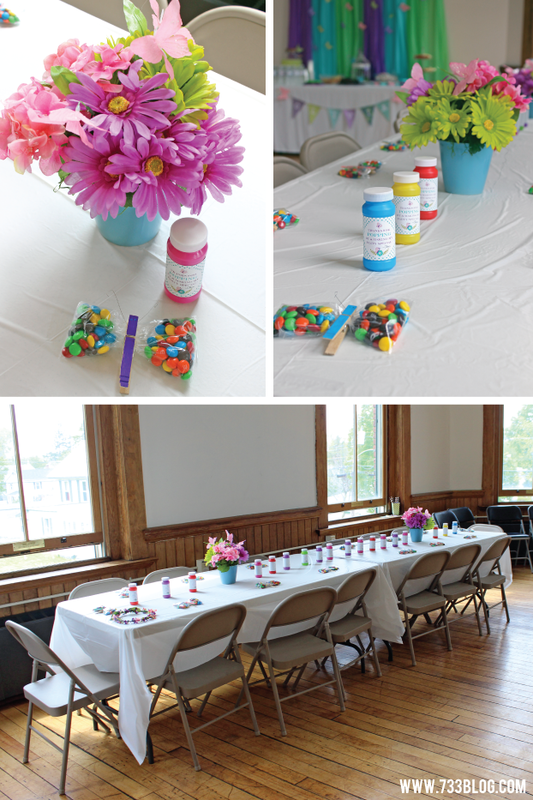 I also made M&M clothespin butterflies as favors for the kids and placed them at each spot around the table. For activities I set up a painting station with pictures I designed for the party. I was actually surprised that so many of the kids sat and painted their entire picture! 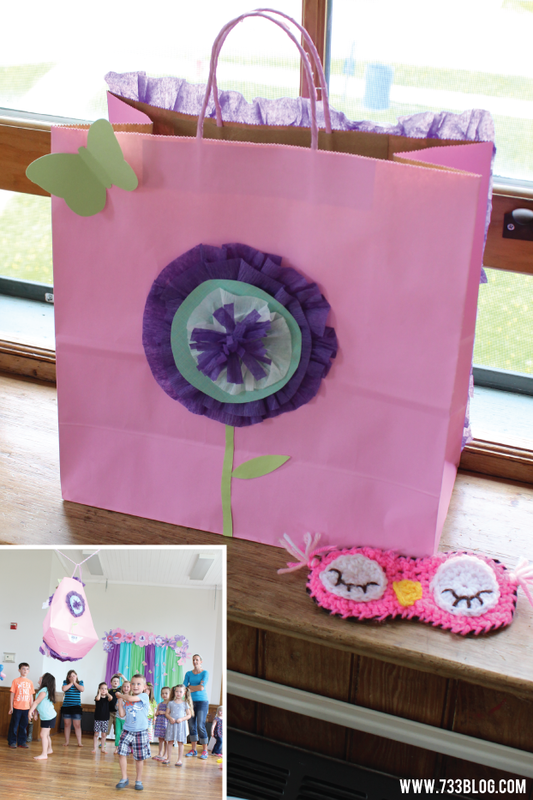 I made a paper bag pinata, which always works well. The kids each had a go at it and it was super-suspenseful as they went through a second round with it hanging by a thread until the last kid took it out with a solid whack! I think this was the best pinata we’ve ever had! I gave out butterfly nets and butterfly shooters, which they got to take home, of course! 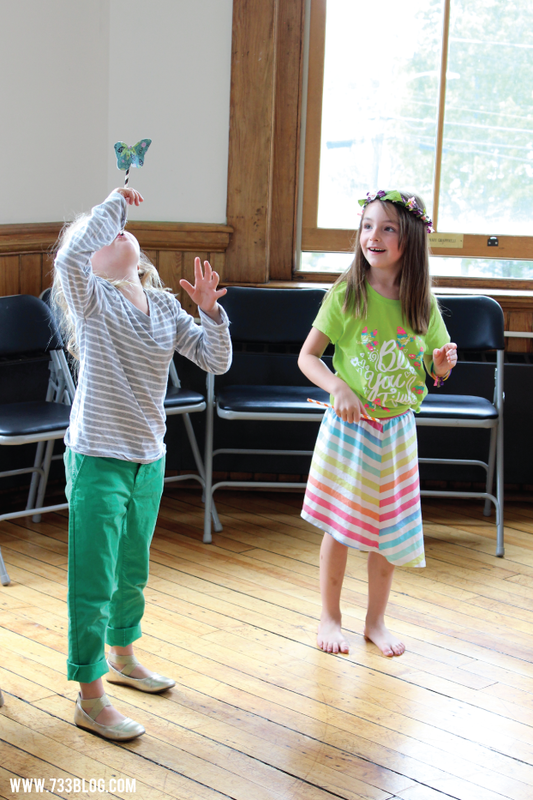 The kids had a blast trying to catch each others butterflies! I also made balloon butterflies prior to the party and handed those out. 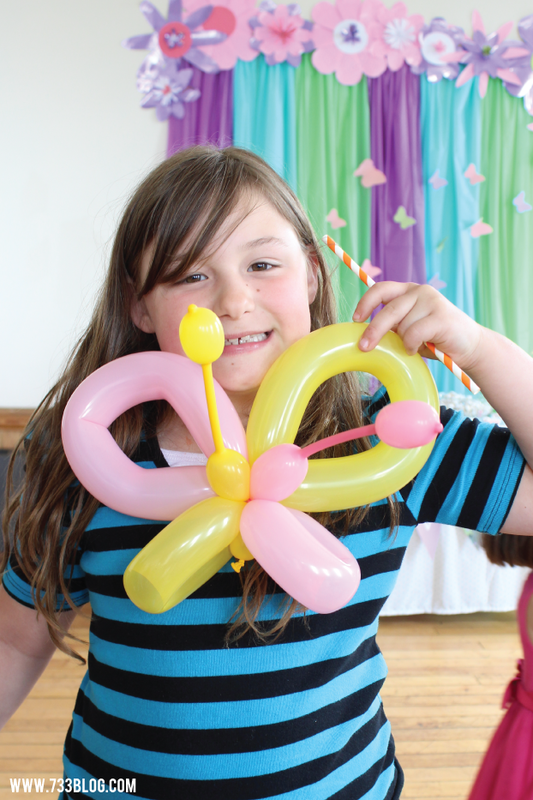 I watched this Butterfly Balloon Animal video – super easy to make! This was another item all the kids had a blast playing with! That’s the main details of the party. 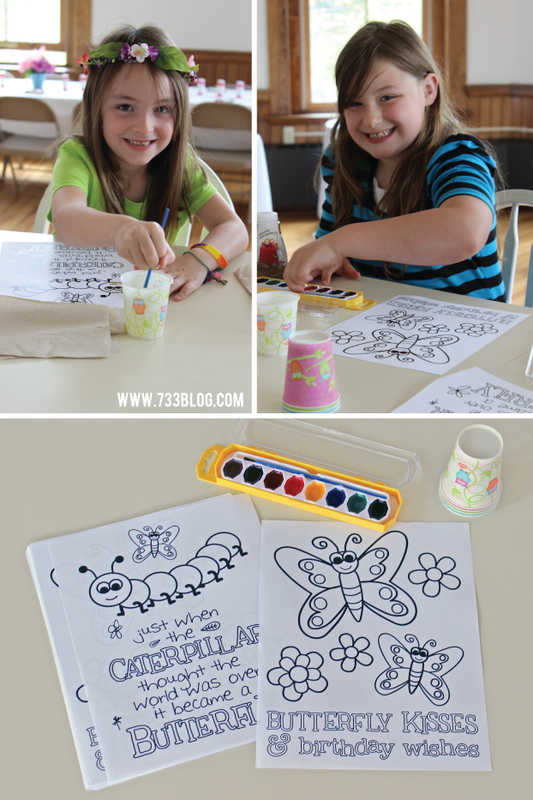 I’ll leave you with a few more pictures of this super fun Butterfly Party! What a gorgeous party! You did a beautiful job with everything! 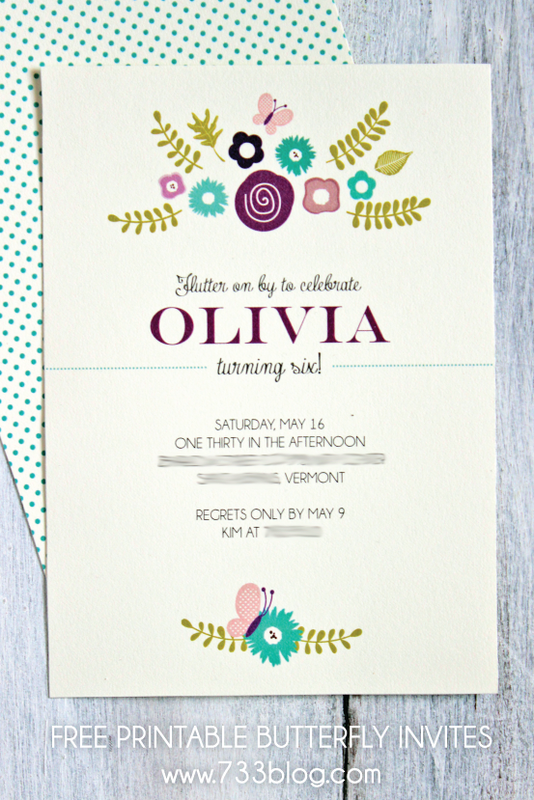 kim, the party is awesomely cute and adorable…thank you fo the freebies….will definitely use it.. thanks God i found your blog, been looking for a month already and getting frustrated, untill i saw yours. That makes me so happy! Best of luck on your party.